Last Saturday, the Bronx Documentary Center had a screening of “Flyin’ Cut Sleeves” with director Henry Chalfant. The documentary was source material for the graphic novel “Ghetto Brother“. Prior to the screening, director Henry Chalfant talked about his first encounter with Benjamin Melendez and how Benjy connected him to his former teacher Rita Fecher. You can see his intro here. 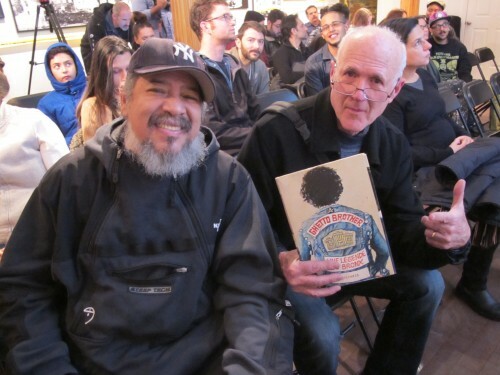 Benjy Melendez presented Henry Chalfant with a copy of Ghetto Brother. More pictures from the event can be found here.